Well, I social media'd this bit to death back when we first got him, but overlooked putting it on the blog, so here's a quick one for ya: The Chase family has recently grown by one member! It's a short, furry, yet-to-be-totally trained member, and we're thrilled to have him! 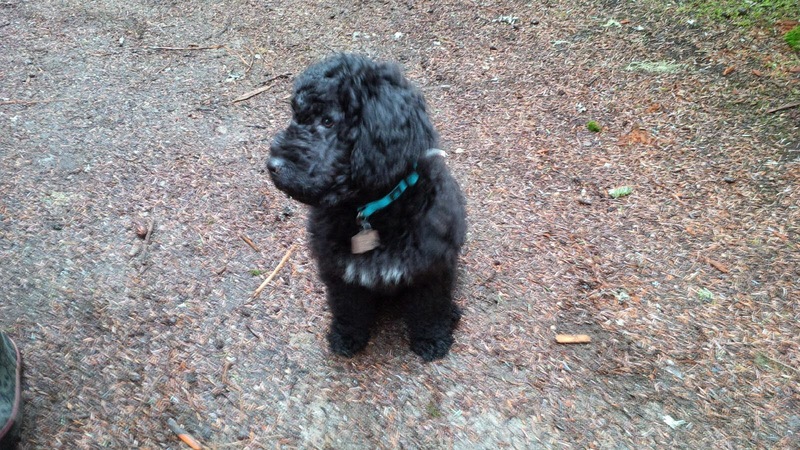 Introducing NINO the Portuguese Water Dog! He doesn't shed which is a nice bonus! We're generally of the 'rescue a dog from the SPCA' state of mind, but one of our family members has developed an allergy to do hair, so we had to get a little more specific than what we could find at the shelter. Nino was born on Dec. 13th, so he even has a birthday twin within the family, sharing the day with one of his humanoid cousins over in the U.K.! I'll keep this brief, and I'll post this video here again for anyone who didn't happen to catch it on the first round. Note, this may not play on mobile, so if you want to view it, you have to get yourself to some sort of desktop computer! Happily for us, by the time we picked him up from the breeder he was already crate trained and (mostly) house broken, so we had an easy(ish) start. Good thing since I just abandoned the family for two weeks to go to a training camp in Florida... more on that next week, maybe! in the meantime, please welcome Nino!